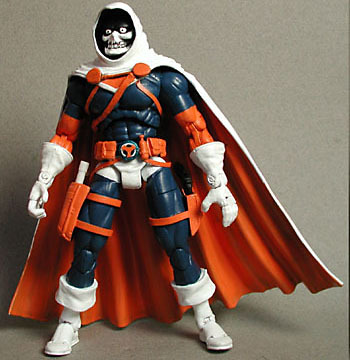 Gifted with photographic reflexes, the man known only as Taskmaster has studied the skills and abilities of many of the world's greatest heroes, and uses his knowledge to run schools for henchmen-in-training. This guy used to be a ML Captain America with Dr. Doom's cape. Strips of cut vinyl provided the various new straps on his costume, one of the holsters came from Daredevil and the belt was from various sources. Who's your favorite under-appreciated Avenger villain? Tell us on our message board, the Loafing Lounge.